There is no better way to relax (in my opinion) than chain piecing. Feeding fabric into the machine, two pieces of at a time, wrong sides together, one after the other. Just you and the machine. Chain piecing can be very useful when it comes time to assemble your blocks into a quilt. See the magic trick being performed in the photo? How the first set of patches are being held floating in the air with the second set of patches? Webbing is all about not cutting that thread. Once you have the pleasing arrangement carry them over to your sewing machine. Sew the first two in row 1. Then the first two from row 2. And 'sew' on. Look, I've joined the first 2 squares in each of my 5 rows. Then without cutting the thread that connects them, I start over with row 1 under the needle and add the final charm square for that row. Keep sewing, leaving everything connected. When you are done, you've got all your rows together and all the rows are connected together. Flip row 1 onto row 2. Pin and sew. Repeat until all rows are sewn together. I hope you found this tip on webbing helpful. I'll be linking up here. Hi Patty! This is such a great idea. I have always chained pieced but I would cut it all apart before I did the next row. I never thought about leaving it all together. What a time saver! I will definitely be using those 2 1/2" squares up now. Thank you for sharing! Hi neighbor! (I'm in the rainy Carolinas, too! Hope you are staying safe and dry this weekend!) This is a great tip....I am like Jan, I would chain piece like crazy, and then snip them all apart. I'll have to try this! My thread chains between pieces are about 1/4 '' long. Things can get tangled if you are changing too many pieces together. If I'm assembling blocks into a quilt, I usually do this by quadrants. Take the upper left and assemble those blocks together. Then take the upper right and assemble those blocks together. That way you are only dealing with the very long row once! 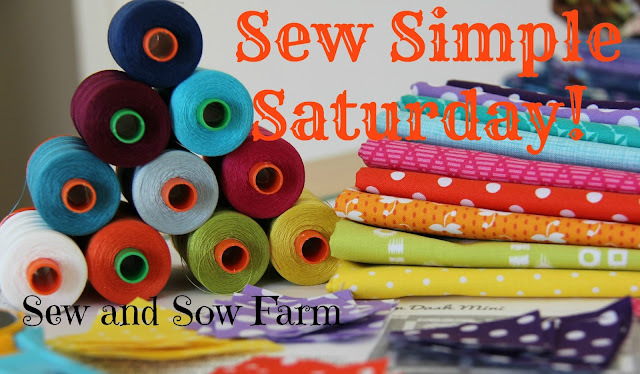 I am getting out my sewing machine to try it! It looks very clever. Thanks for the tip. Another Carolina gal, interesting idea, but how do you press the seams? I find it makes sharper corners to press the seams in opposite directions then nest them. Can you do that with them all hooked together? You can either finger press or carry the webbed fabric right to your ironing board. Since everything is webbed together, you don't get confused on remembering the placement for the blocks/pieces. If the pieces are small - like the example I was using - I usually finger press or use a travel iron. Love your tip, I've been doing it this way for almost 30 years! I'm glad it's becoming popular. This is a great tip for me! Thank you so much for sharing this. Oh, webbing is yhe best tip that i have ever learned. ?..it will save me so much time! One of the most helpful things about this is that you've put a name to it! It is so much easier for me when I can identify a concept by a coherent title; "Webbing" is perfect. Thanks for laying it out so clearly. What a brilliant idea - a time saver that eliminates confusion and mistakes in sewing together a layout! Does it work with large squares too?